A dedicated single-ended amplifier and discretely configured phono stage for all types of audio sources, featuring an elegant nod to vintage design and luxurious real wood side panels. Yamaha A-S1100 fully inherits premium qualities of Yamaha's emotionally dynamic sound. With a dedicated single-ended high grade integrated amplifier design, the unit draws out all the intricate details of your player or DAC. The basic design of the power amplifier circuit adopts Yamaha’s own, uniquely developed Floating and Balanced Power Amplifier technology. Elements with the same polarity on the plus and minus sides of the output stage, and also completely separating the Negative Feedback circuit and power supply into total of four plus and minus sides of the left and right channels, results in thoroughly symmetric push-pull operation of the output stage. Completely floating the entire power amplifier circuit from the ground removes any negative impact of minute voltage fluctuations or ground noise. Moreover, the output elements are comprised of MOSFETs, which provide a warm and natural sonic character. 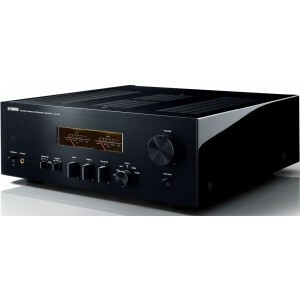 Since this device employs a dedicated single ended amplifier, it provides excellent response in amplification of single-ended analogue sound from all kinds of audio sources, such as CD players of D/A converters—and the A-S1100 takes advantage of this in having been carefully fine-tuned for optimum sound quality. By fully utilising single-ended amplification, the A-S1100 transparently draws out the intrinsic qualities of your favourite audio devices, including those made by other manufacturers. This amplifier adopts an all-stage fully discrete configuration through all sound circuit stages, using only the most meticulously selected high-precision parts from input to output. (Applicable during tone control circuit defeat.) The slew-rate of the audio signal has been improved to bring lively and strong response to high musical notes. Moreover, the tone control circuit lets you switch to defeat state and enable a full discrete configuration that bypasses the op-amp IC of the internal circuit, simply by setting the BASS/TREBLE knobs to their centre points. The phono amp is comprised of an MC head amp and an equaliser amp, each of which are discretely configured, resulting in a rich sound with pronounced musicality, when playing vinyl records with both MC and MM phono cartridges. By strengthening the capacity of the high current route and by pursuing thorough low impedance design, including forming screw clamped wire connections of major ground points, the A-S1100 boasts excellent speaker drive power with a damping factor of more than 250 (8Ω, 1kHz). Along with the large-capacity power source transformer equipped with an EI core, this design delivers bass reproduction that is both strong and uplifting. We’ve utilised a high-quality digital volume control specially designed by New Japan Radio Co., Ltd., which consists only of adder-type resistance, removing the impact of slew-rate decline or colouring of the sound, delivering higher purity in the sound, and excellent, fast response to large volume changes and steep transients. Moreover, the tone controls employ a triple-parallel method, minimising the detrimental impact on sound quality seen with straight-line tone controls. In addition, the bass, treble, and common circuits each utilise simple construction in which the NFB of the amp is not used and the CR elements are simply fixed in a straight line, ensuring exceptionally pure sound reproduction even when tone control is applied and superb response to audio signal transients. When tone defeat is applied, straight signal flow from only one volume circuit to a discrete configuration buffer amp is realised. Bought this about 6 months ago with a Yamaha CDS1000 CD Player, the match is perfect and also bought Tannoy XT6F's to go with it, wow what a system for all music types. The first thing I will upgrade are the speakers as I feel the amp will drive much better ones. The amp seems to have endless controlled power, highly recomended especially for this money!